Posted on February 28, 2018 by Kelly M.
There’s no better feeling than the sun on your skin and fresh air in your lungs on one of the first warm days of spring. Don’t blink though – before you know it the season will be over! 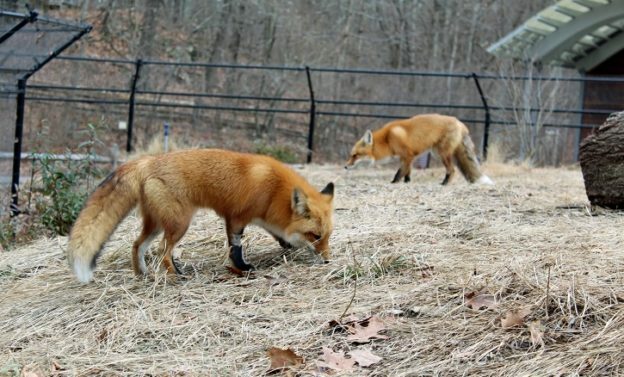 Live March to the fullest by celebrating all it has to offer, including sheep shearing and lamb season, Saint Patrick’s Day, wildlife observation and care, and all things maple. Maple Magic – Friday, March 2 / 3:30 pm-5:00 pm (families with children ages 0-12). It’s maple sugaring time! Visit the relaxing maple grove to check the taps and taste some sap. Learn how we’ve made maple syrup from past to present and delight your taste buds with a sweet maple treat. Homeschool Maple Science and History – Wednesday, March 7 / 1:30 pm-4:30 pm (children ages 5-12). 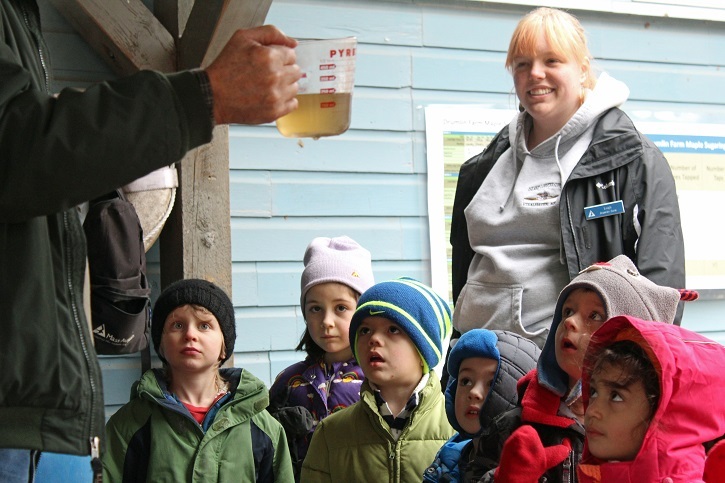 Especially designed for homeschooled children, you’ll learn about the structure and seasonal adaptations of maple trees as we visit the sugar shack and experiment with sap, syrup and sugar. We’ll venture out to the sugar bush, collect sap, learn about sugaring equipment of today and yesteryear, and enjoy a maple treat. Sip Some Sap – Thursday, March 8 / 10:00 am – 11:30 am (families with children 3-12 years old). Listen to a story about maple sugaring and take a walk out to our sugar bush. We’ll check out the evaporator to see how sap is turned into syrup, and get to try some ourselves. Vacation Week Programs captivated by what sap looks like before it becomes syrup. March Into Spring Series – Fridays, March 9, 16, & 23 / 3:30-5:00 pm (families with children ages 3-6). Learn about sugar and syruping, spring chickens, and wool in this fun family series that covers everything great about March. 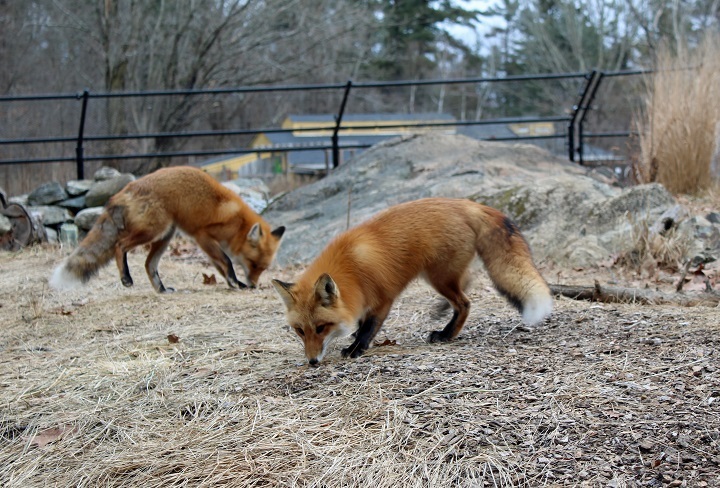 Play together while exploring the farm and meeting the animals that call it home. Sap-to-Syrup Farmer’s Breakfast – Saturday & Sunday, March 10 & 11 / 9:00 am – 1:00 pm (adults and families with children of all ages). This annual celebration is the tastiest of them all! Learn about the maple sugaring process while enjoying a delicious breakfast of pancakes, real maple syrup, and Drumlin Farm’s own sausage and roasted potatoes. Drumlin Farm made syrup will also be available for purchase. 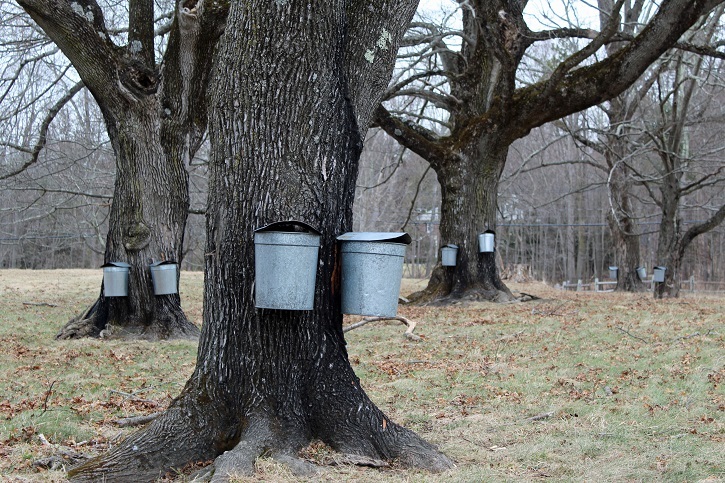 Visit our sugar bush to check the sap buckets and enjoy this calm stand of trees. St. Paddy’s Party – Thursday, March 15 / 10:00-11:30 am (families with children ages 0-8). Did you know that ‘drumlin’ is a Gaelic word for “littlest ridge?” We’ll plant shamrocks, greet a snake, and enjoy some boxty, a traditional Irish potato treat. We might even dance a jig or two to celebrate this greenest of holidays. 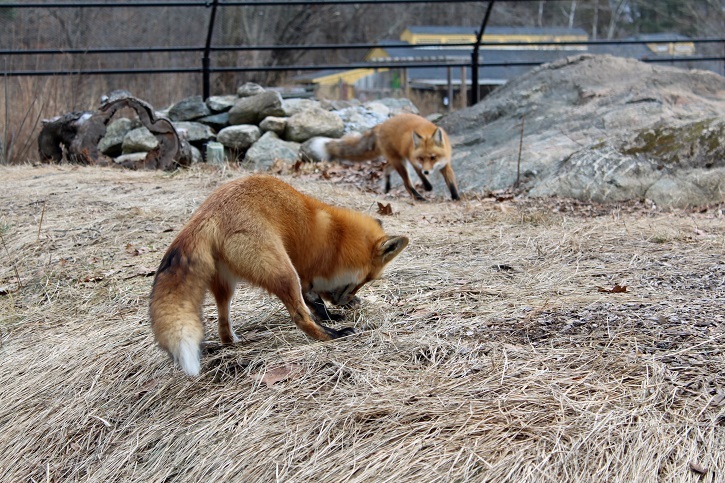 Afternoon Chores & More – Saturday, March 17 / 3:30 pm – 5:00 pm (families with children ages 4-12). Get ready for chore time! Walk the site in a farmer’s shoes, helping us care for livestock. We will feed chickens and collect eggs, and bring hay to the sheep, goats, and cows. After finishing, we’ll treat ourselves to a farm snack. 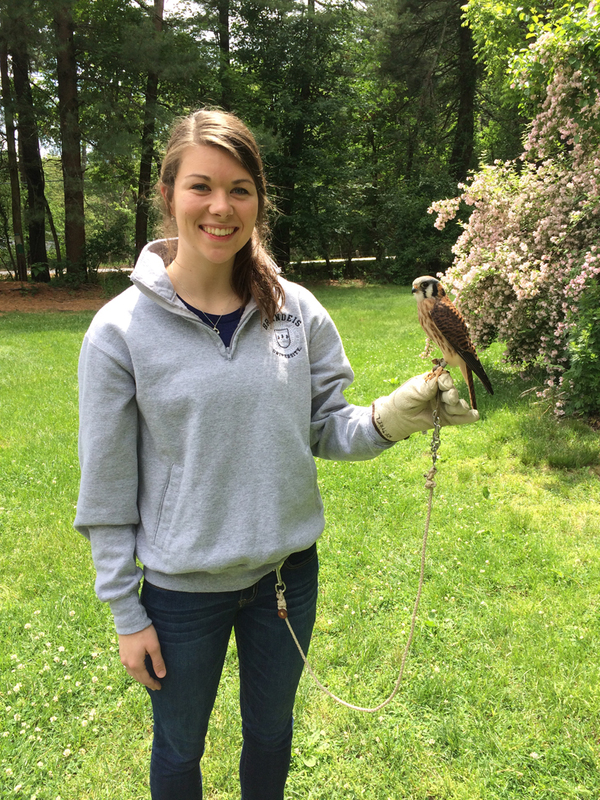 Spring Wildlife Caretakers – Sundays, March 18, April 15, & May 20 / 1:00 pm – 3:00 pm (teens ages 13-17 years old). The first class of our ever-popular teen wildlife group starts in March – perfect for anyone thinking about a career in wildlife care, or that has a passion for animals. 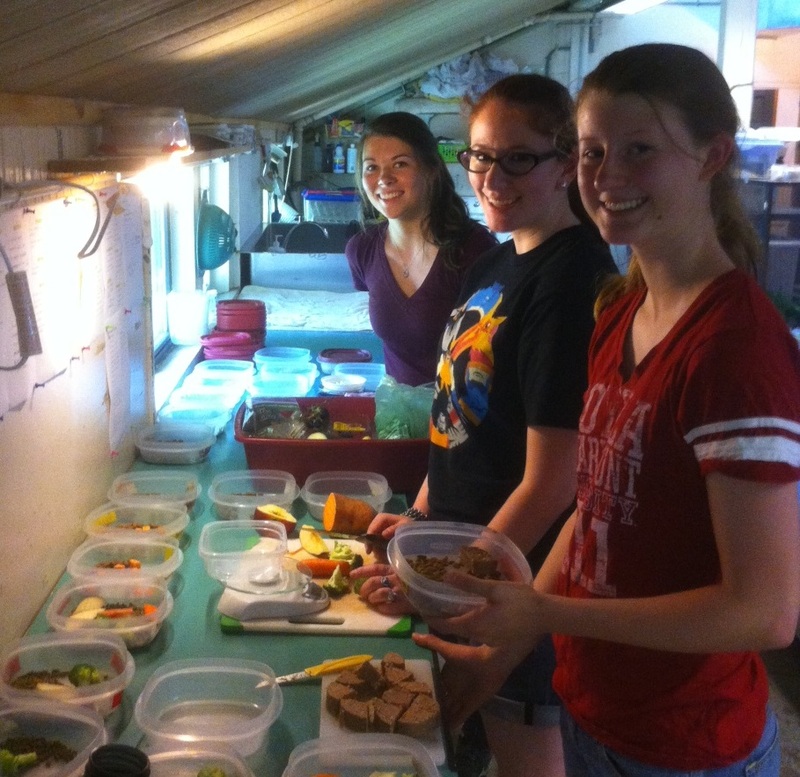 Join other like-minded teens to learn about wildlife health, animal enrichment, diet requirements, food preparation, and other related topics. 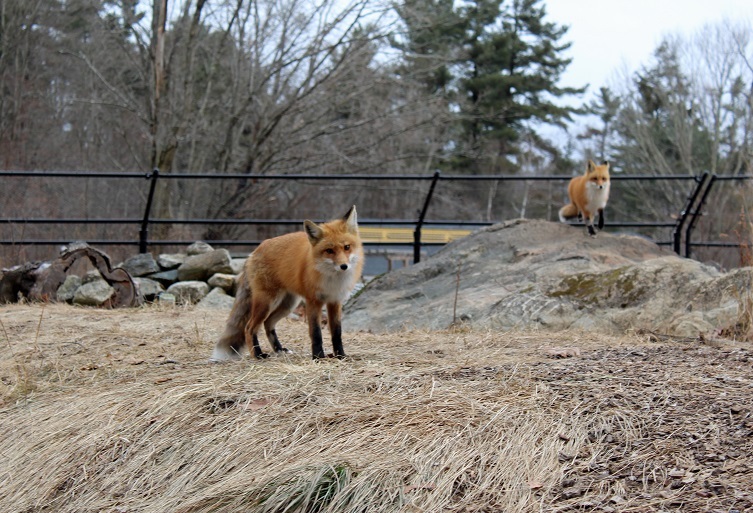 Go behind the scenes and get a close-up experience under the guidance of our wildlife care staff. Bread & Bunnies – Thursday, March 22 / 10:00-11:30 am (families with children ages 0-7). Hop on down to the kitchen for some hare-raising fun. We’ll visit a rabbit on the farmyard then head into the kitchen to bake bunny’s favorite treat: carrot bread! Woolapalooza – Saturday, March 24 / 10:00am-4:00 pm (adults and families with children of all ages). 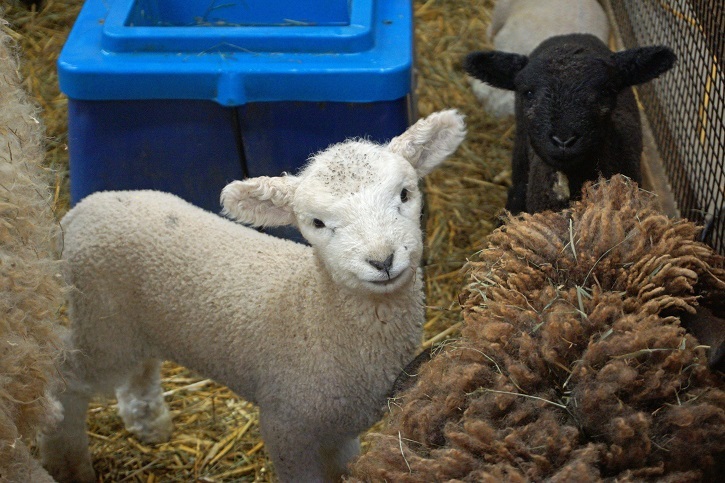 Visit our newborn lambs, see live sheep shearing and herding demonstrations, shop local fiber artisan crafts, and more! Woolapalooza is our annual celebration of all things wool, and a fabulously fun time to visit the farm and participate in our mission to connect people with nature. Welcome our new baby lambs to the farm at Woolapalooza! 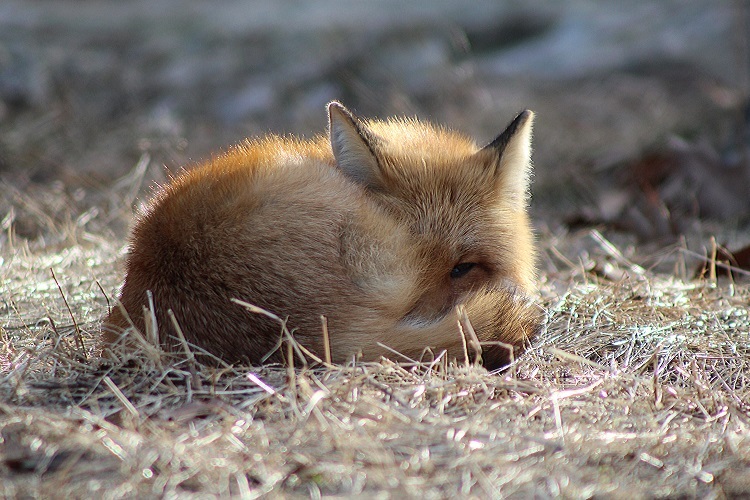 Birding Great Bay and the New Hampshire Coast – Sunday, March 25 / 7:00 am-5:00 pm (adults). Explore an area few Massachusetts birders visit. We’ll start at Great Bay, 5000 acres of tidal water in New Hampshire, then follow the coastline to Salisbury, Massachusetts, stopping at vantage points to look for sea ducks, loons, grebes, snow bunting, horned lark, bald eagle, snowy owl, and wintering shorebirds. 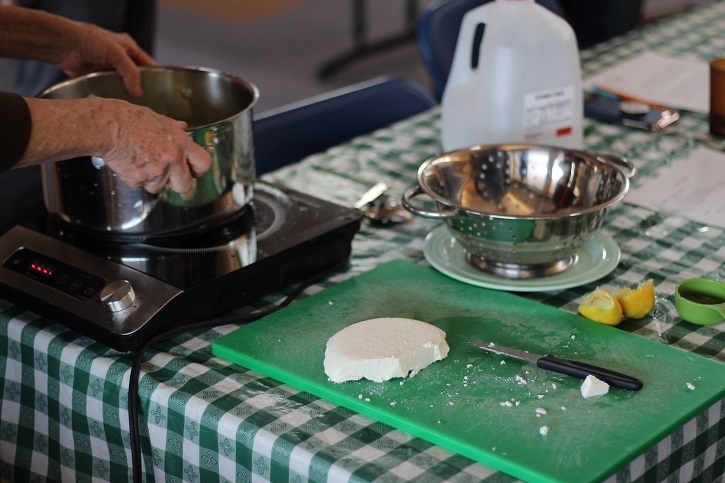 Simple Cheesemaking – Saturday, March 31, 2018 12:00-4:00 pm (adults). Cheesemaking is delicious, fun, and surprisingly simple! 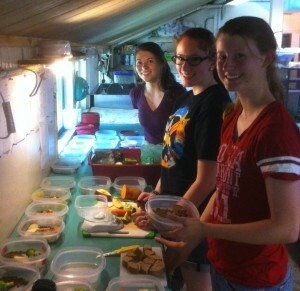 During this workshop, you’ll make and sample several different cheeses, learning about their makeup and history. You’ll leave with more samples, recipes, resources, and the skills you need to pursue cheesemaking, one of the oldest forms of food preservation, on your own. Learn the skills to enjoy fresh homemade cheese whenever you want! 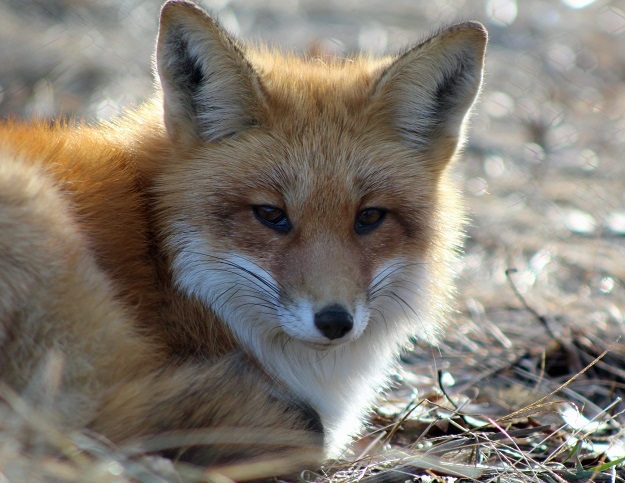 This entry was posted in Uncategorized and tagged bunnies, cheese, cheese making, chores, farm, food, foodie, maple programs, maple sugaring, march, saint patrick's day, wildlife on February 28, 2018 by Kelly M..